People have been making beads from rose petals for centuries. And this simple process has not changed much over the years. Make these beads to preserve flowers from a memorable event. Or use them to make fragrant jewelry or rosary beads. Whatever their intended use, you’ll find them easy to make. But the process is time consuming. Prepare to devote the better part of your day to making these beautiful natural beads. Collect roses that have just reached their full bloom. 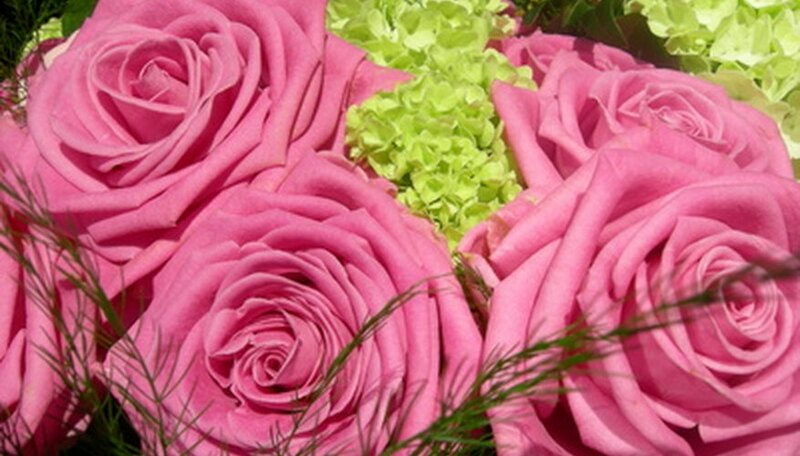 Strip the roses of their petals and remove the white base at the bottom of each petal with a pair of scissors. You will only be using the rose petals; discard everything else. Process the petals in a food processor until they are in tiny pieces that are roughly the size of couscous or grits. Simmer the rose petals in just enough water to cover them. Simmer them for an hour. Turn the water off and let the roses cool to room temperature. Then simmer them for another hour and let them return to room temperature again. Continue this cycle of simmering and cooling until the rose petals achieve a thick, consistent paste-like texture. Add more water as necessary. Strain the rose petal pulp through a sieve. Put in a cupful or so at a time and press the pulp against the sieve to remove as much water as possible. Put the strained petal pulp into a clean container and then strain a new batch until all of the petal pulp has been strained. Make the rose petal beads. Pinch off a bit of the clay-like rose petal mash and roll it into a bead shape. As the petal beads dry, they will decrease about 50 percent in size so take this into consideration when sizing your beads. String the beads on a wire. Don't let the beads touch as they are drying. Hang them in a dry place for several days until they reach the consistency of dried beans. To decrease the drying time, hang the wire from the top rack in your oven while it is on the lowest heat setting. As the beads dry, turn them on the wire periodically to keep them from sticking. Remove the beads from the wire. To make a full necklace or rosary, you will need at least half a shopping bag full of rose petals. Roses that have been sprayed (with anything) are unsuitable for bead making. Save the liquid you strained from the beads for recipes. Spray the beads with varnish if you want them to last longer but keep in mind that they will look less natural. Roll the dried beads in scented rose oil if they have not retained their smell. Store in a tight container to retain rose scent. They also pick up nearby odors. Don't put them near your fishing tackle or ashtray. Cast iron frying pans give the rose petal beads their dark red, almost black color. Using an enamel frying pan will result in lighter beads. Your wire size should ideally be between 16 and 20 gauge for necklaces and rosaries.